The Grand Tree, home to the peaceful Tree Gnomes, has become ill and appears to be dying. Can you find out the cause and save the tree before it's too late? The Grand Tree, which shelters the majority of RuneScape's small gnome population, is dying. Is it human sabotage or an inside job? Help King Shareen to find the true cause and save the tree gnomes from an uncertain fate. Begin by speaking to King Narnode Shareen in the Grand Tree. To begin the quest, head to the Tree Gnome Stronghold, which is northwest of East Ardougne. Enter the Tree Gnome Stronghold and go to The Grand Tree near the back of the stronghold. Enter the doors in the center and speak to King Narnode Shareen. Ask him what's wrong and he'll ask to speak to you in confidence. He'll take you downstairs and show you the roots of the Grand Tree. The King will explain that the Grand Tree is showing signs of sickness and asks you to help. Say that you will to begin the quest. Narnode says that his top tree guardians, Glough, suspects human sabotage. 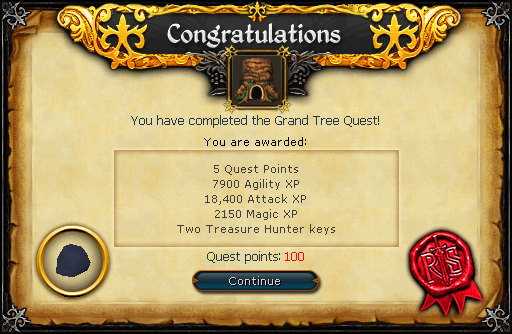 But to confirm this, Narnode asks you to find Hazelmere, one of the mages that helped create the Grand Tree. Hazelmere can be found to the east of Yanille. 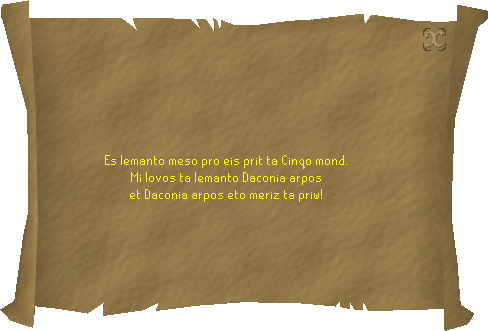 The king give you some sample tree bark and a translation book to understand what Hazelmere says. If you have the Ardougne Cloak 1, use it to teleport to the Kandarin Monastery. If you have a Ring of Dueling, use it to teleport to Castle Wars. If you have an Ardougne Teleport tablet or a Watchtower teleport tablet, use it now. From these points, walk to the peninsula east of Yanille. If you have access to Fairy Rings, use the code CLS to arrive right outside Hazelmere's house. If you have none of these, you can walk all the way. Your character will ask Hazelmere to write down what he says. He gives you a scroll once he's done. The king realizes someone forged his seal to obtain the Daconia stones. The Daconia stones are safety measures to kill the tree in case something went wrong. The king will send you to inform Glough, who lives right in front of the Grand Tree. Go southeast of the Grand Tree and there should be a ladder. Climb it to find Glough inside the tree house. Speak to Glough and he'll tell you that he will take care of everything and sends you back to the king. Talk to the king, he tells you that they have captured a human who had Daconia rocks and are keeping him prisoner. Climb the ladder and keep climbing it until you get to the top floor. Talk to Charlie the prisoner, and the conversation reveals that Glough is up to something. Charlie suggests that you go search Glough's house to find something. Go back to Glough's house and search the cupboard, it's directly north from the ladder you climb to get in. In it you'll find Glough's journal. If you read through his journal you find that Glough is gathering support to launch an attack on humans! Talk to Glough about the case with Charlie and what you found in his journal and he will deny it. Once your character accuses him of poisoning the Grand Tree, Glough calls his security and has you arrested! You'll end up in the prison cell next to Charlie. Talk to him and he'll tell you to go to Karamja and talk to the shipyard Foreman if you want to learn more about Glough's plans. He gives you the password “Ka-Lu-Min” to use. At this point the king arrives and apologizes for your arresting and sets you free. However, Glough has set up guards to prevent you from escaping, so the king tells you to hitch a ride with one of the Gnome Gliders. Make sure you have an emergency teleport before this part! Once the king finishes talking to you, walk a few steps north to Captain Errdo. Tell him you want to go to Karamja, and you'll both set off. Sadly, his wife is no longer with us. He then reveals that Glough assigned him to built 30 battleships to take over RuneScape! Head back to the entrance of Tree Gnome Stronghold. Because Glough has guards stationed to keep you from entering again, you have to find another way of getting in. Talk to the gnome Femi and she can help you find a way in. Femi is standing right by the entrance. She'll sneak you in through her food cart and then you can go see the king. Even with the added evidence the king is stubborn as ever, and refuses to believe that Glough is behind everything. Go to the top and talk to Charlie once more. He tells you to go see Glough's girlfriend Anita for some help. Now go to Glough's house for the last time, but this time be prepared for a tough fight. 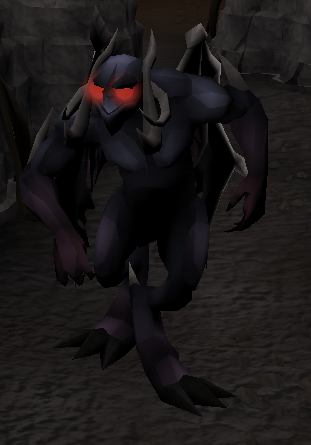 You will be facing off against a level 140 Black Demon. It's suggested to Mage (the demon is weak to water spells) and if you plan on Meleeing regularly it is suggested to have 43 Prayer (for Protect from Melee), lots of food and/or prayer potions. A trapdoor will then appear behind you. Make sure you are prepared before you enter the trapdoor, as this is where the big fight happens. Once you enter the trapdoor, a short cutscene will occur. The camera will zoom out and Glough will appear. He will confess that it was him behind everything and that you can't stop him. He then reveals his secret weapon... a black demon! After that, start whittling away at his health. If you are safespotting it shouldn't take you long to kill him. If you are meleeing or are fighting him directly, keep a close eye on your health! The demon can hit very high so you want to keep your health pretty high. The use of protection prayers can make this fight easier. After you've killed the demon, Glough will run away. Go to the end of the tunnel and you'll find King Narnode Shareen. After talking to him, despite everything that's transpired, he still doesn't believe you! King Narnode sends out a guard to check out what's in the passage. The guard comes back and reports that Glough was hiding under a pile of Daconia stones. The king apologizes heavily for not listening to you, but there is still the Daconia rocks to take care of. Search all of the roots until you find the Daconia rock, and then bring it back to the king. 18,400 Attack experience 7,900 Agility experience 2,150 Magic experience Ability to use the Gnome Gliders transport system. Ability to use the Grand Tree Mine. Ability to use the Spirit Tree inside the Tree Gnome Stronghold. 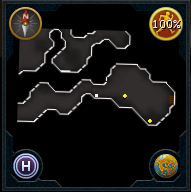 Ability to use the Agility shortcut from the Grand Tree to the Barbarian Outpost. [^] Talk to King Narnode Shareen to start the quest. [^] Talk to Hazelmere on the island east of Yanille. [^] Translate his scroll with the translation book. [^] Talk to King Narnode. [^] Search Glough's cupboard to find his journal. [^] Take the glider to Karamja. [^] Open the gate with the password. [^] Answer the Foreman's questions or kill him for his lumber orders. [^] Go back to Tree Gnome Stronghold. [^] Talk to Femi to get back in. [^] Arrange the twigs on the stands in Glough's house. [^] Go down the trapdoor, make sure you're prepared for a tough fight. [^] Defeat the Black Demon. [^] Search the roots for the Daconia rock.